A new year and a new exhibition programme for 2016 here at the Fosse Gallery. Ten diverse and colourful exhibitions to look forward to from the beginning of next month to the end of the year. At the moment we are happily continuing with what was our Christmas mixed show and the gallery is still richly hung with paintings by our Fosse artists. Never the less in a few weeks’ time our first invite of the year will drop for Charlie Calder-Potts, a major solo exhibition titled ’Book of Kings’. 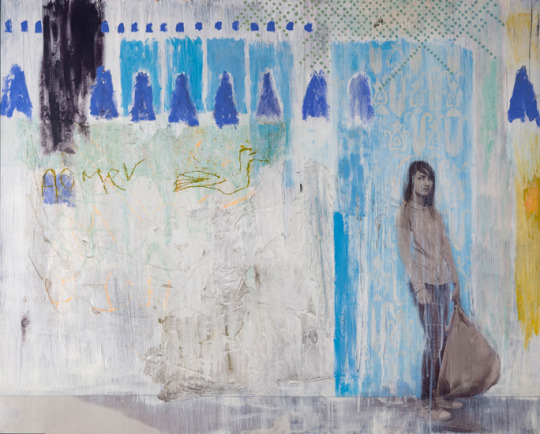 As an Official War Artist in 2013, at the tender age of 28, and with the British Army in Helmand and Kabul, the exhibition looks at both the ancient and contemporary relationship between the Middle East and the UK. 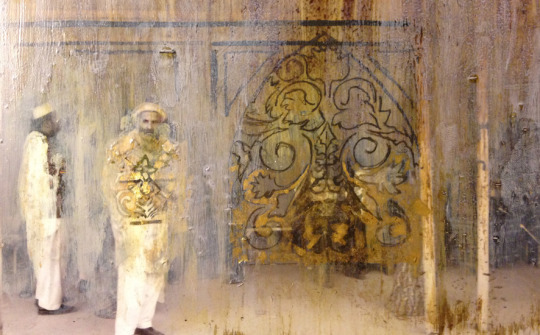 The work is predominately mixed media on aluminium but there will also be mixed media on copper, armoured scrap metal from Helmand Province and traditional manuscript vellum paper made in the UK. 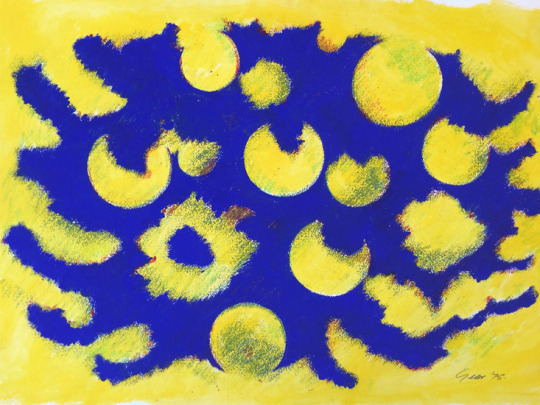 “Unlike most war artists Calder-Potts was not parachuted in to alien territory. She has been travelling around the Middle East since her teenage years, immersing herself in the rich culture of a region now almost exclusively presented by the media as an ideological battle ground between East and West – a perception this exhibition sets out to correct.“ remarks art critic Laura Gascoigne. This will be the first solo exhibition for Charlie here at Fosse, although she has been involved in many mixed exhibitions with us over the years. For one so young she has already exhibited in Dubai, London, New York, Amsterdam and France. In March we then change direction totally and the gallery will be hung with the rural heritage of Mid Wales in the shape of Seren Bell. One of the most endearing and well known animal artists working in the UK, this will be Seren’s second One Man show here at Fosse. 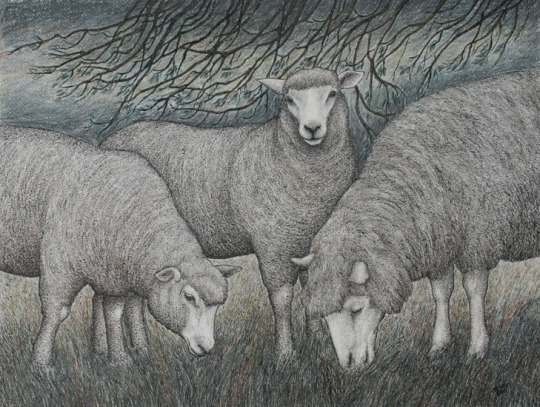 Her original crayon, pen and ink drawings of native breeds are hugely in demand. She is well known in particular for her beautiful and heartfelt studies of sheep and lambs, but included in this body of work will be ancient pigs, well manned hounds and flash cockerels. Perfect for the month of March when we look forward to the optimism and colour of Spring. As well as kicking the year off with two great exhibitions, we shall be photographing and putting up on our web site under his artist page some works on paper by William Gear RA. Kept in a portfolio here at the gallery and never been seen before – it will be good to share it. All works are for sale, unframed and from the artist estate. Our web site has become such a major tool to us here. We enjoy working on our Facebook and Twitter accounts and we have had over 8000 likes on our Facebook page – we reached over 21,000 people last week alone on Facebook. To join in, follow us on Facebook or Twitter. I am also totally amazed at our worldwide audience through the internet with people visiting our gallery website regularly from USA and Europe and even from Australia, Thailand, Columbia and Panama. Thanking everyone for continuing to support us and plugging themselves in to our gallery exhibitions and social media – it is so much appreciated.